Congratulations are in order for the celebrities who climbed Kilimanjaro in order to raise money for comic relief. 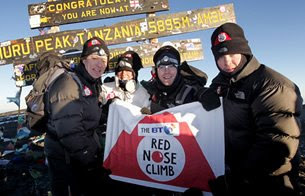 Amazingly all of the celebrities (and numerous film crew/producer types) who attempted the mountain made it to the summit and so far they have raised £1,526,127 for Comic Relief's campaign to help reduce the numbers of people dying from Malaria every year. Well Done! You dont have to be a national celebrity to help rural communities in Tanzania. Volunteer on our Tanzania Schools and community project and make a difference yourself, constructing and renovating schools and classrooms to improve education facilities.